Students enrolled in SMSCP powered by Festo Didactic will gain a hands-on understanding of the mechatronics system. 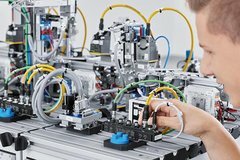 Students enrolled in Siemens Mechatronic Systems Certification Program (SMSCP) powered by Festo Didactic state-of-the-art equipment will gain a hands-on understanding of the complexities of the mechatronics system. By design, they will graduate with the soft skills and technical skills needed to thrive in advanced manufacturing careers. Through the SMSCP partnership, Festo supports students, instructors, and learning institutions, addressing the talent shortage as the manufacturing industry quickly evolves. By receiving training and mentorship directly from Industry 4.0 professionals, students learn from a curriculum set aligned and up to speed with industry advancements. Festo and Siemens are committed to improving access to the industry’s best trainers, sophisticated learning systems, and industry-approved curriculum – because certified workers get hired faster and paid better. When students have the opportunity to learn in a simulated smart factory environment, on top-of-the-line equipment and with adequate exposure to problem-solving scenarios they’ll encounter in a real job setting, they are equipped for success immediately upon graduating. We’re proud to support students with viable career-programs that lead to advanced degrees, competitive salaries, and world-class technical skills.